Setting Quilts on Point - the easy way! Thread: Setting Quilts on Point - the easy way! 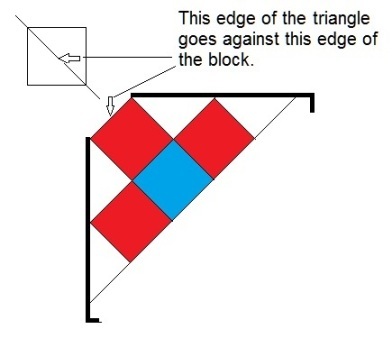 At the request of a member here, I am posting this tute on a very helpful, so simple way to figure the setting triangles for setting your blocks on point in a quilt. Thanks so much for this tutorial. I copied & pasted to my Word program & printed it off for future reference. Great tutorial Jan...thank you for sharing. This one is a keeper. Thanks, Jan. I'm working on a quilt now that is set on point. Thanks Jan! I love doing “on point” quilts. I am working on Pam Buda’s 1800 quilt now. Thank you Jan! I am embroidering blocks now that will be placed on point. I always seem to mess that up. Your diagram and tutorial is perfect. Thanks for sharing this Jan! Thanks for this tutorial---I have some blocks that I wanted to set on point and this will sure help. Thanks very much for this tutorial. 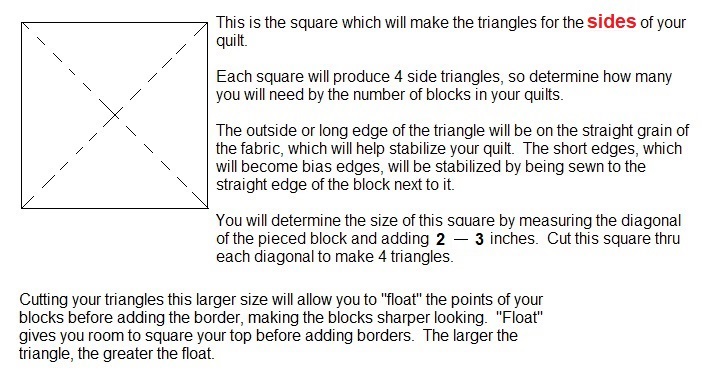 I wish I had had this tutorial when I did my first on-point quilt...what a nightmare that was. With your great tutorial, I feel any future on-point quilts will go much more smoothly. Thanks again. I think I might be setting my current quilt on point. It'd be a first for me, and I needed a really clear tutorial like this to give me confidence to try, Thanks so much. Thank you so much for this tutorial, Jan. Thanks Jan, for the clear explanation. Glad to hear this will work for so many of you! I pur rhia on my bookmark and intend to keep it. Gonna print it out. Thanks so much Jan. I think putting blocks on point makes them ten times more elegant! Thanks, Jan! I will be keeping this tutorial.